One of our favorite aspects of the Star Wars universe is just how expansive it is—every object, every ship and every character in the background, no matter how minor they may seem, have their own backstory. For the 40th anniversary of the franchise, Del Rey Books is paying tribute to these background characters with a collection of 40 stories called From a Certain Point of View. The project has assembled an all-star group of authors and voice actors, including famed Mad Men leading (mad) man Jon Hamm. 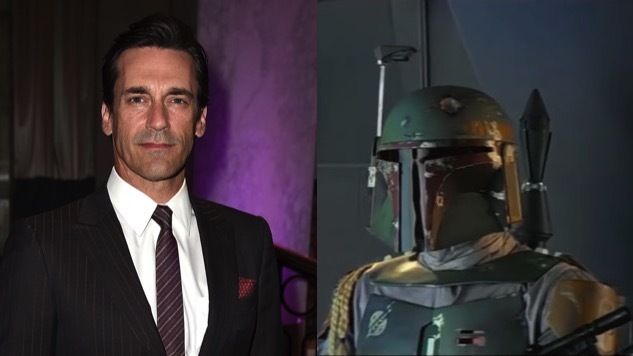 Hamm will voice infamous galactic bounty hunter Boba Fett, a character most famous for just looking cool without actually doing much. Fett was voiced by Jason Wingreen in The Empire Strikes Back with a very pirate-like cadence, and re-dubbed by Jango Fett portrayer Temuera Morrison (in a pretty generic fashion) in re-releases of the Star Wars Original Trilogy—Hamm will likely have his own take on the disintegration-happy bounty hunter, rather than imitating either actor. Per today’s post on the Star Wars website, the audiobook will focus on “X-wing pilots, droid-hunting stormtroopers, and more background characters from Star Wars: A New Hope,” with other significant names attached including Neil Patrick Harris, who will narrate a story focusing on an Imperial officer on the Death Star, and Janina Gavankar, who will star in the story mode of Star Wars: Battlefront II. The ambitious project will come in the form of audio, hardcover and ebook on Oct. 3. We sure hope these stories will include Anakin Skywalker’s unique point of view.